What is the best deadlift program for a beginner in fitness? You know the impressive benefits of deadlifts to lean out your body and gain strength. Therefore, you want a deadlift program for body transformation and/or to compete in powerlifting. This 12 week program will help you accomplish either goal. No matter what your age. Did you ever think of deadlifts as a tool for weight loss and fitness? There is a good chance that you have not. Walk into any gym, and you will see more treadmills than deadlift platforms. Go to the weight training area, and you still will not see many deadlift workout stations. You will find various isolation machines to work individual muscles. As well as benches for dumbbells, bench presses and incline bench presses. power racks for squats and Romanian deadlifts. But you will not find a specific workout station to do deadlifts. Inside a power rack, with the safety rods removed. Outside the power rack, but you run the risk of getting in the way of people walking by. Find some other patch of gym turf where you can set up for deadlifts. Create a home gym or garage gym. The point is that when people go to a gym to workout, they are usually not thinking deadlifts. Especially people who are overweight. When do you see an overweight man or woman doing a deadlift workout? A simple deadlift only program accelerates your quest to get fit. If you are overweight, it is time to consider deadlifting. Because the deadlift is an excellent tool for weight loss transformation and fitness. The free weight room is intimidating, granted. But, you will make great fat loss progress if you stick with a beginner deadlift program (with your doctor's permission). You need to eat right, strength train with deadlifts and rest. If you do these three things, your will change your body fast. You only need to deadlift once a week. Some advocate deadlifting every other day or twice a week. But, even a deadlift workout once a week is sufficient to see results. Especially if you also squat and bench press one other day of the week. If you squat, do your deadlift workout about 3 days after your squat workout. They both work your legs hard and you need rest to increase muscle mass. Why the Deadlift of all Exercises? The simplest answer is that the deadlift works more muscles than just about any other strength training exercise. Other than the squat, the deadlift reigns king over all other strength training. Why go to the gym and sit in a chair to lift weights? You are just isolating specific muscle groups. You will gain much more by targeting all the muscles of your body at the same time. The deadlift is the full body weapon to accomplish that goal. The deadlift is not a very complicated move. You bend down, and lift the weight off the ground to a standing position. This is why even the overweight or obese can deadlift. But, it is not easy either. Many great athletes have focused on the deadlift to improve their skills. Even in sports that on the surface, have little to do with deadlifting. For example, Allyson Felix used the deadlift to become a great Olympic gold medalist in running. Barry Ross, US Track and Strength Coach, created one of the most famous strength programs for Allyson Felix back in 2002. 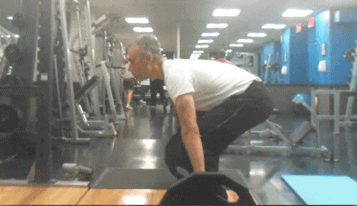 He chose the deadlift as the centerpiece of her strength training workout. Because the deadlift works a greater percentage of the muscles and involves multiple joints. “Why waste time and energy on squats or leg press machines?” Ross wondered aloud in his 2004 article ‘The Holy Grail of Speed Training”. In ten months, Allyson's deadlift went from 125 pounds to 300 pounds. As a result, her 200-meter sprint time improved and she ran the fastest 200 meters in the world (without resorting to drugs) for all women. The deadlift helped Allyson Felix win gold at the 2012 Olympics in the 200 meters. As a result of becoming a phenomenal Olympic champion, Allyson Felix's net worth is now over 8.5 million dollars. If world class athletes can benefit from deadlifts, so can you. You just have to start. Start slow, with light weights or even no weights. The Essential Proper Form Deadlift Checklist. Warm up before your deadlift workout. See One Great Deadlift Workout Routine for an effective deadlift warmup and deadlift workout. For example, walk, run, do elliptical, jump rope or jumping jacks for at least five minutes. After, do self-myofascial release on your hamstrings and quads, the back and front of your legs. Then, do good mornings with a resistance band or barbell, and farmer's walk with kettlebells. This warm up is explained in detail in this beginner deadlift workout routine for powerlifting and fitness. Eat vegetables, fruits, nuts, lean protein to fuel your body. Learn the simple secrets of the Hashi Mashi diet and avoid processed, restaurant and take out food. Learn how to cook for yourself. To learn more about better nutrition, read about the impact of eating real food, and how real food daily transforms your body fast. If you need to lose weight, this guide how to lose 20 pounds in 3 month will work magic. Nike Metcon 4 Cross Training Shoes keep you low to the ground, increases foot stability, and prevents knee sprains. Moxy deadlift socks to prevent shin scraping and keep your knees warmed up. Single Prong 10mm Powerlifting Belt – The belt helps you learn how to brace your core, besides protecting your back. Every deadlift workout will follow the same pattern. We will use an estimated 1RM of 200 pounds to illustrate a sample deadlift program. If you are not sure, here is how to calculate your 1 Rep Max for this deadlift program. First deadlift warmup set: 5 reps using 100 pounds or 50% of your 1 Rep Max. Rest 3 to 5 minutes. Second warm up set: 3 deadlifts using 120 pounds or 60% of your 1RM. Third warm up set: 2 deadlifts using 150 pounds or 70% of your 1RM. These are your deadlift work sets. 3 sets of a rep range of 4 to 6 reps with 160 pounds starting with 75% of your 1RM. When you can comfortably handle 6 reps at 75 percent of your 1 rep max, now you can increase the deadlift weight to 80 %. Gradually increase the weight, using 5 or 10 pounds of additional weight. You will find fractional plates useful as well. If you cannot increase by 5 pounds, then increase by 2.5lbs or 1.25 lbs. Work up to 95% of your baseline 1 rep max. Start your work sets at a new weight using a rep scheme of 4 reps and build up to 6 reps. Then you can increase your deadlift weight again. Once you reach 95% of 1RM, retest and start progressing again for weeks 7 to 12. Record all your workouts as Ed Coan testifies that his great progress came from consistent and accurate record keeping of his deadlift workouts. It is not a bad idea to schedule a break of 1 week after every 6 or 12 weeks of deadlifting. You can do accessory work like stiff leg deadlifts, Romanian deadlifts or good mornings, and then begin a new 6 – 12 week deadlift program cycle. You have to go on vacation or do something else a few times a year, right? 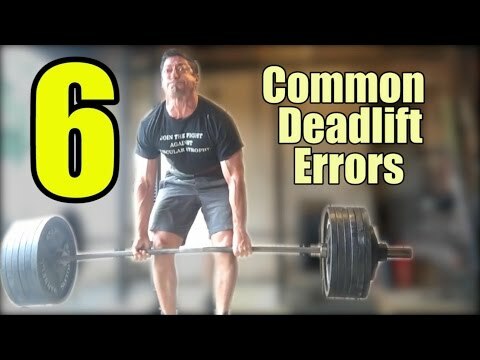 If you are an advanced deadlifter, check out this deadlift program from Josh Bryant. You do not have to become the strongest guy or woman in the gym to benefit from deadlifts. In fact, you do not need to use heavy weights, insane volume or heavy deadlifts to get leaner and stronger than you think possible. This 12 week deadlift program will help you lose weight and get fit. The deadlift is one of the most powerful tools I used to lose 75 pounds and 18 inches off my waist in 6 months. Yes, I was as shocked as you will be. Food is your friend, not your enemy. Just eat the right foods and you will see results. Deadlifts are one of the most powerful exercises in your arsenal. Feeling and getting fit, getting as healthy as possible is the real goal, not just losing weight. Please share this 12 week deadlift program for beginners. Just pin the image below, thank you!